We’ve always strived to leave no stone unturned in our quest to bring you, our loyal, wise, and slightly smelly readers the absolute best in custom bikes. And the bike you see here is no exception. It’s one that has been doing the rounds on a few sites of late, but information has been sadly lacking. The reason? She’s straight outta Downtown Tainan City, Taiwan with a builder who speaks English about as well as I ride. Or Scott tap dances. Come to think of it, Scott tap dances quite well – but you get the gist. Never ones to rest on our laurels, we activated our crack team of international linguistics experts (OK – he’s a guy I used to get drunk with in Hong Kong) to get us an exclusive interview with the man himself. See? See what we do for you guys? Don’t you just love us? Yeah. We love you too. Now go and have a shower, the lot of you. 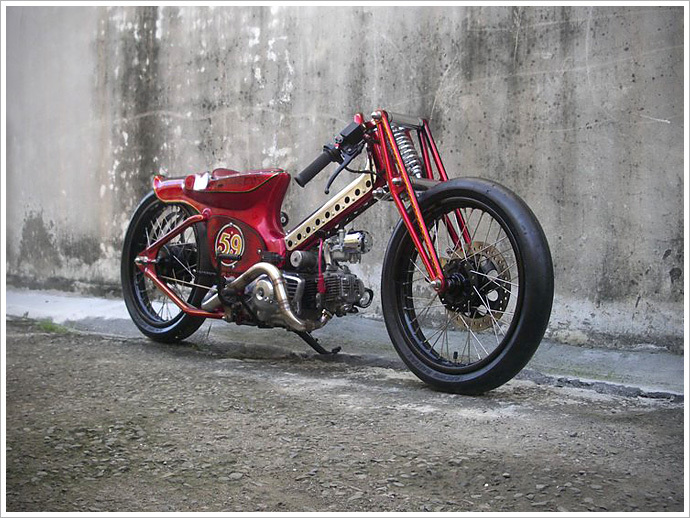 I get inspiration mostly from online magazines about custom bikes. I have a background in metalwork, so it’s was a pretty easy trade for me to get in to. 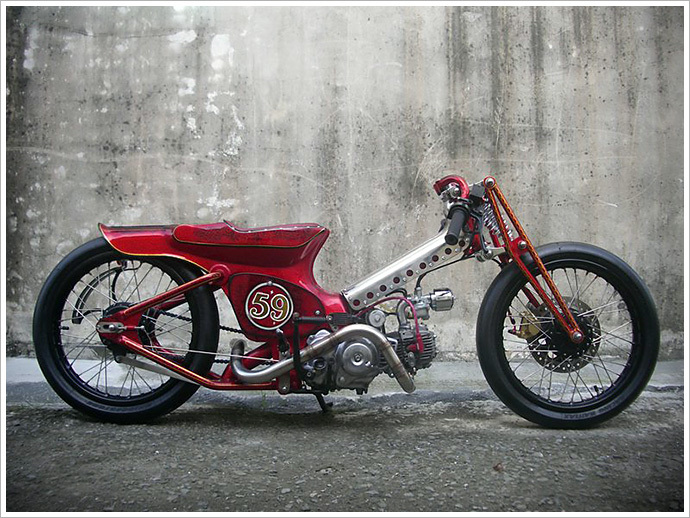 Can you take us through the process of building the Redman ’59? 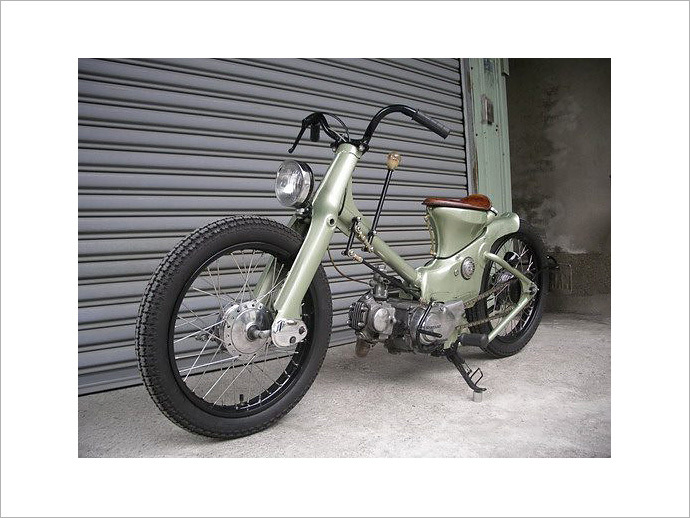 It’s originally a Sym 90, a popular Taiwanese bike brand. You can find the build photos here. 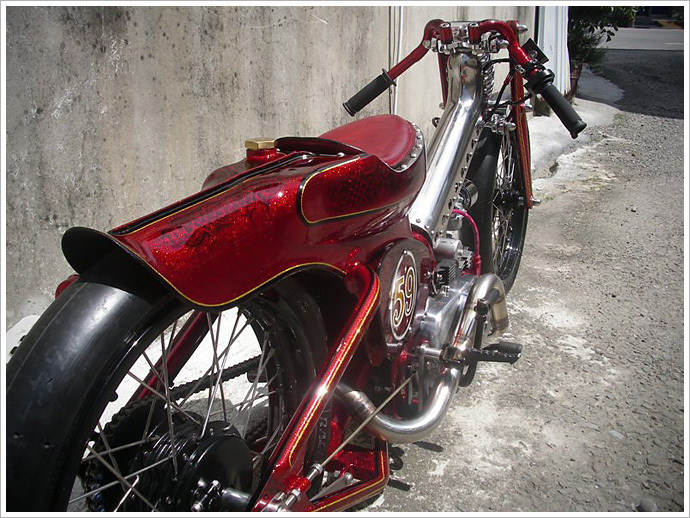 The most difficult part was to keep the characteristics of the original bike but to also make something different and new. In the end, I went for an old drag bike look. My favorite part is extension of the frame. 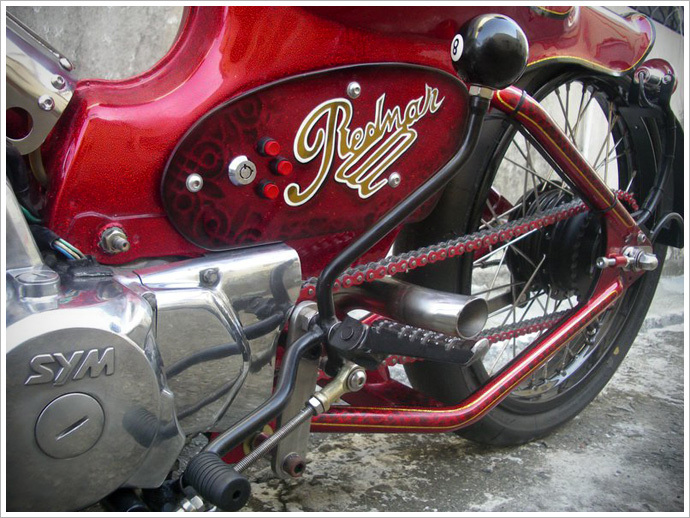 If I had another chance I would extend the rear frame to have a ducktail-like mudguard. What is the bike like to ride? Nice paint – who did it? Painting was done by experts from Magical Brush Painting Studio (魔筆漆畫工坊) in Taichong city. That’s a really unique headlight placement. Was it your idea? 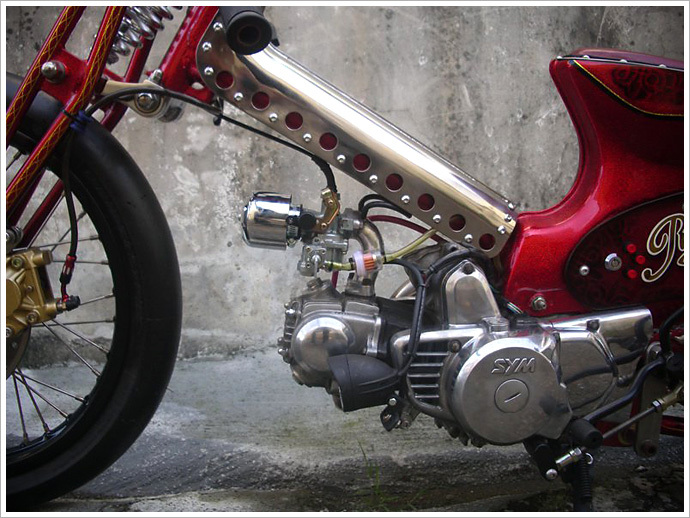 It’s my idea, because the front fork doesn’t match with headlight, so I chose the lower left; it keeps the function without affecting the overall shape. 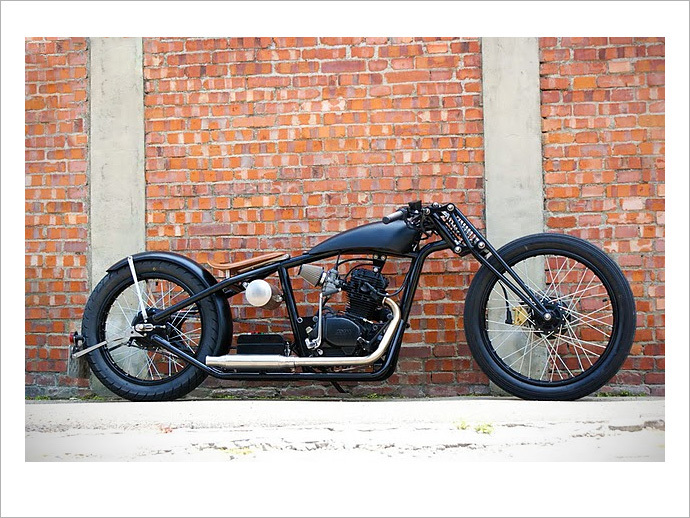 So there you have it – the latest and greatest in custom bikes from Taiwan. What’s next in our never-ending search, you ask? Well, as soon as Scott gets back from Mongolia we’ll be doing multiple stories on the scene there. Sure, we probably should have done a little research to make sure they actually have a bike scene there, but the guy needed a break anyway. All that tap dancing, you see.